The financial markets opened 2014 with caution and an expectation that a rising interest rate environment in the U.S. may hurt both stock and bond prices. Over the course of the year, however, U.S. economic growth continued to improve, while a slowdown in aggregate demand and overall growth abroad kept downward pressure on rates. This led to a continuous strong performance in U.S. equities, and also boosted the returns of longer term bonds. Small cap stock returns were less stellar, while international fixed income and equities posted flat to negative returns for the period, reflecting the slower growth rates in international markets. 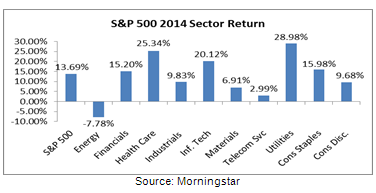 As can be seen from the chart above, the strong returns of U.S. stocks were concentrated in large cap stocks. Small cap stocks as indicated by the Russell 2000 Index lagged their large cap counterparts by over 7%, and even within large caps, the gains were concentrated in a few sectors like Utilities, Healthcare and Technology. In Technology, the gains were even further concentrated as large index constituents such as Apple (APPL), Microsoft (MSFT) and Intel (INTC) were leaders. International stocks as indicated by the MSCI EAFE Index underperformed U.S. equities for a sixth year in a row, and the performance difference of 17% was the largest in almost two decades. In fixed income, the unexpected but steady decline in rates drove bond prices higher, helping the returns of longer term bonds. The most interest sensitive bonds fared best, with the Barclays U.S. 20+ Year Treasury Bond Index outperforming even equities and posting a 27.48% return for the year. In the environment highlighted above, diversification also did not work for most portfolios, as allocations to smaller cap or international stocks, short-term bonds or commodities underperformed the broad large cap indexes that are usually highlighted in the media. Partly as a result of these developments, 2014 ended up as one of the worst years for active managers, with close to three quarters of funds in several major categories underperforming their benchmarks. Active management, which tends to focus on qualitative measures to make informed investment decisions suffered as gains were concentrated in few sectors and in long term bonds, areas of the market which were widely seen as overpriced at the beginning of the year. Investors who held a diversified portfolio have noted that their returns have largely trailed the headline numbers. This raises the fair question - is holding a diversified portfolio still worthwhile? To us the answer to this question is unequivocally yes. While diversification may not always get the highest return in narrow markets such as 2014, a portfolio that is diversified tends to be better positioned to participate if returns in non-U.S. assets revert to historical averages. And as market returns tend to be mean reverting, we believe that a move away from diversification in response to past returns may be ill timed. Going forward we believe that fundamental valuation will begin to play a larger role in equities as monetary policy normalizes. Typically, supportive economic policy leads to a period of rapid recovery, and in such periods, lower quality names outperform as they have this year. But as the markets shift toward growth, higher quality names, which continue to deliver on earnings and maintain dividends, tend to perform better. Active stock selection based on fundamental research is likely to perform better in conditions of expansion and slow GDP growth - historical returns from Datastream and Goldman Sachs show that in periods of slow GDP expansion, stocks with high or steady earnings per share growth (EPS) may outperform lower EPS growers by as much as 30%. Volatility is likely to remain elevated and we do not know where the markets will head next. But we believe diversification is the best approach to mitigating downside risk, and a continued focus internationally may allow for improved returns as conditions abroad stabilize. We also retain a conviction in active management, as we believe a focus on fundamentals may better serve investors in the intermediate to long term.